Artist Original Annette Herrmann. Erin. "OOAK, each is dressed and accessorized differently. As always, all of my dollies are born in the U.S.A.". Erin is 9.5 inches tall. Hand-numbered at the back of her neck by Annette. 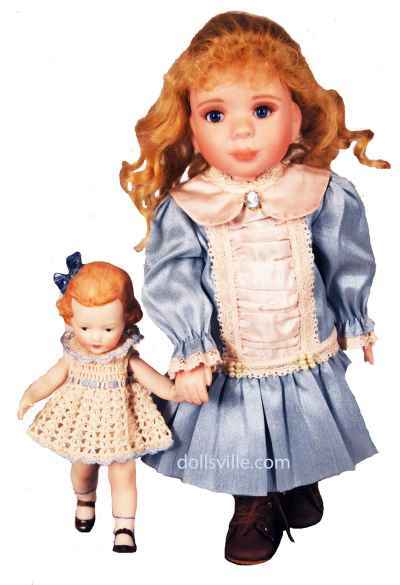 This sweet blue-eyed Herrmann Original doll has a porcelain head with jointed resin body. Beautifully costumed in blue and ecru with delicate tucking, bodice shirring and a pleated skirt, lace trimming on the long sleeves. Miniature Cameo at the neckline. Her long, curly blonde wigged hair is styled loosely in ringlets, with bangs. Included is her little porcelain bisque Antique repro Dolly "Forget-Me-Not, a jointed doll with painted hair and eyes. wearing a co-ordinating ecru and blue crocheted dress. Certificate of Authenticity.